Pipes and Drums of the Irish Guards, 2009. The most common form of pipe band, the Scottish/Irish Pipe Bands, consists of a section of pipers playing the great highland bagpipe, a section of snare drummers (often referred to as 'side drummers'), several tenor drummers and usually one, though occasionally two, bass drummers. The entire drum section is known collectively as the drum corps. The tenor drummers and bass drummer are referred to collectively as the 'bass section' (or in North America as the 'midsection'). The band follows the direction of the pipe major; when on parade the band may be led by a drum major, who directs the band with a mace. Standard instrumentation for a pipe band involves 6 to 25 pipers, 3 to 10 side drummers, 1 to 6 tenor drummers and 1 bass drummer. Occasionally this instrumentation is augmented to include additional instruments (such as additional percussion instruments or keyboard instruments), but this is typically done only in concert settings. Pipe bands are a long-standing tradition in other areas with Celtic roots, such as the regions of Galicia, Asturias and Cantabria in Northern Spain and Brittany in Western France, as well as other regions with Celtic influence in other parts of Europe. The tradition is also long-standing in the British Commonwealth of Nations countries and former British colonies such as the United States, Canada, Australia, New Zealand, South Africa, India, Malaysia, Singapore, Hong Kong, Brunei, Sri Lanka and Pakistan. Pipe bands have also been established in countries with few Scottish or Celtic connections such as Thailand, Colombia, Mexico, Brazil, Chile, Uruguay, and Argentina. It is known that pipers served in regiments from the earliest times; the Royal Scots have records referring to pipers dating back to the early seventeenth century. Where pipers were employed as pipers (rather than just happening to be a soldier who also was able to play), they were employed by the officers of the regiments as private pipers. This situation continued until the 1840s, when Queen Victoria's enthusiasm for all things Highland was instrumental in the War Office's decision that each battalion of the Highland Regiments be allowed five pipers and a Pipe Major, which continues to be all that the British Army provides funds for to this day. Any additional pipers in the battalion pipe band were and are equipped today by funds from the Officers' Mess Fund of the battalion. By this time, pipers were already playing together with drummers, probably modelling themselves on the fife and drum bands which had existed in Switzerland since the 15th century. Drumming is as ancient as the concept of formed military units, and their original purpose on the battlefield was to signal tactical movements and keep cadence on the march. By the end of the Crimean War, pipe bands were established in most of the Scottish Regiments. The first civilian organizations to adopt pipe bands were police and fire brigade bands; even today, several forces maintain bands that play to a very high standard. By the time World War I broke out, the pipe band represented a popular image of Scotland, both internally and externally. Military pipers were killed and injured in significant numbers in the Great War, before the War Office banned the practice of playing in the trenches in 1915. The ban was often not observed; Canadian piper James Richardson was awarded the Victoria Cross for playing in action in 1916. Pipes have occasionally played into battle, notably at El Alamein, Dieppe, the Normandy beaches, and the crossing of the Rhine. The Calgary Highlanders went into action for the first time at Hill 67 in Normandy with company pipers playing; it was the only time the Regiment did so. Military pipers have also served in both Gulf Wars. In military and para-military organizations the term "pipes and drums" refers to an ensemble of Highland bagpipes and drums, but the majority of modern military bands are similar to their civilian counterparts in their instrumentation and music. 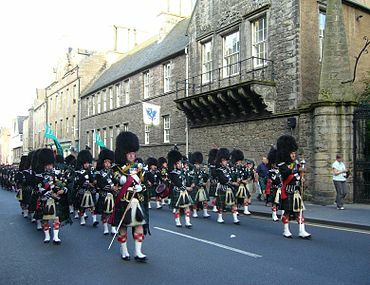 Many of the same standard tunes are found in both the military and civilian pipe band repertoires, and many similarities exist in terms of musical style, historical and musical influences, and dress and deportment. A military Remembrance Day parade in Ottawa, Ontario. Unlike civilian pipers, however, pipers in British military bands have additional military responsibilities. Nowadays, musicians in British Army bands are normally required to take on a secondary role in the battlefield as medics. However, in most cases the pipes and drums in a Scottish or Irish infantry regiment constitute a machine gun or mortar platoon (as the Corps of Drums does in an English or Welsh infantry regiment). As a result, in addition to being musicians, members of the pipes and drums must also be qualified fighting soldiers. Unlike musicians, who belong to the Corps of Army Music, the pipers and drummers belong to the regiment in which they serve and are soldiers first and foremost. The British Army runs its own pipes and drums training facility, the Army School of Bagpipe Music and Highland Drumming, in Edinburgh, Scotland. To be qualified as a pipe major or drum major in the pipes and drums of a regiment of the British Army, candidates must successfully pass a series of courses at the school. The City of Auckland Pipe Band playing Amazing Grace during the festival interceltique de Lorient in 2016. The music played by pipe bands generally consists of music from the Scottish tradition, the Irish tradition and the Breton tradition, either in the form of traditional folk tunes and dances or music from the Western tradition that has been adapted for pipes. Examples of typical pipe bands forms include marches, slow airs, up-tempo jigs and reels, and strathspeys. In recent years there has been a great deal of emphasis placed on new forms, especially the suite. A good example of a suite for pipe band is Don Thompson's composition Journey to Skye (1987). In conventional pipe band music, each section of instruments has a different role in the music. Generally speaking, the pipers deliver the melodic and harmonic material, while the side drummers provide a rhythmically interactive accompaniment part. The tenor drummers provide the fundamental rhythmic pulse and the bass drummer anchors the rhythms, providing a strong and steady beat. The roles of each section are broken down further below. The bagpipers are responsible for providing all of the melodic material in the music. Generally speaking, all of the pipers play a unison melody on their chanters, with their drones providing the harmonic support and filling out the sound. These unison melodies are often quite complex and demanding. It is this complexity that provides much of the musical interest. When harmony is written within the pipe section, it is usually a two-part harmony, and is usually scored in a 2:1 ratio (with two-thirds of the players on the melody and one third of the players on the harmony part). Because of the limited range of the chanter, the harmonic possibilities are somewhat limited, but well-written harmony in a pipe band setting can be extremely effective. Pipe band harmony is sometimes referred to as 'seconds', although this simply refers to a second part and not to the interval of a second. In fact, intervals of a second are rarely found in pipe band harmony parts, except in passing. Instead, it is the consonant intervals which are stressed, such as perfect fourths and fifths, and even more commonly, parallel thirds and sixths. In contemporary arrangements, a merge between harmony and melody known as 'counter-melody' has been aired. A counter-melody is similar to a harmony part, but is distinguished because it has a melodic line of its own. Counter-melody can take a completely different thematic approach and can dramatically change the flow and atmosphere of the melodic unison. This technique is relatively new in the pipe band circuit, and in most cases require skill and timing to achieve in full unison. The drum corps of a pipe band consists of a section of drummers playing highland snare drums and the bass section (see below). In the early days of pipe bands, rope tension snare drums were common, but as the technology evolved, so did the music. Pipe band drummers now play on drums with very tight, knitted kevlar heads, designed for maximum tension to create a very crisp and strident sound. Due to technological innovations and changing aesthetics, this crispness has become an integral part of the pipe band sound. Since today's drum is so facile as a result of its design, players are often able to execute extremely complicated and technically demanding rudimentary patterns. The pipe band drum corps is responsible for both supporting the piping with a solid rhythmic foundation and sense of pulse, often creating an interesting contrapuntal line unto itself. The line played by the drum corps (referred to as the 'drum score') is usually based on rudimentary patterns and can often be quite involved, with solo, unison and contrapuntal passages throughout. A popular pattern in many scores is for the lead drummer to play a phrase, and the section to play in response. This technique is known as seconds (sometimes referred to as chips, or forte). While standard practice in pipe bands is for the pipe section to perform the traditional or standard arrangements of the melodies, including gracenotes, drum scores are very often composed by the lead drummer of the band. In competition, one of the adjudicators grades a band on how creative their scores are and how well they fit the piping. This aspect of the judging is known as 'ensemble'. The bass section (also referred to as a midsection) usually consists of a section of tenor drummers and a bass drummer. Their role is to provide rhythmic support to the entire ensemble. In this respect, the bass section allows the drum corps to delegate their timekeeping responsibilities and allows more freedom in the drum scores. Tenor drums in their modern form are a relatively new addition to the pipe band. While pipe bands of yesteryear would often include tenor drummers, they would usually be "swinging tenors", players who would swing their sticks for elaborate visual effect but who would rarely play. Today's tenor drummers play pitched drums, and careful thought is given as to which pitches to use and at which times. The pitches help provide melodic or harmonic accompaniment to the bagpipes; creating a more dynamic flow between the drum corps and the pipe corps. In some cases, five or six tenor drummers have been used, providing a palette of individual pitches for use in a variety of musical situations. The swinging also known as flourishing has developed somewhat into an art form, with drummers playing and swinging in unison or sequential flows. Tenor drums are also still commonly played on a soft harness, or sling, instead of the typical marching harness used by the snare drums, but shoulder harness tenors are now used by several pipe bands. Pipe band uniforms vary from band to band. However, the typical uniform consists of a glengarry (cap), shirt, tie, waistcoat (vest), jacket, kilt, hose and dress shoes. Each pipe band has its own signature tartan that may reflect the area the band originated from or the history of the band. Jackets and waistcoats are usually black, and shirts are often short-sleeved for comfort. Each band also has its own tie, which can match the kilt tartan, or is sometimes merely a block colour. In competition, appearing smart in uniform is essential; some competitions have dress codes, for instance certain types of jackets only, ties must be knotted at the collar and so on. Pipe bands often vary the uniform worn, depending on the formality of the occasion. Very formal occasions require jackets to be worn, whereas less formal occasions do not, and only the waistcoat is worn. On semi-formal occasions, the jacket is not worn, but a long-sleeved shirt is worn under the waistcoat. This increases the formality of the outfit, but decreases the comfort. On occasion, no waistcoat is worn, in which case the shirt sleeve must be of long length. Pipe Major uniforms are usually different, to distinguish them from the other members of the band. More traditional highland dress may be worn, sometimes with a feather bonnet. Competition is a primary focus for many pipe bands throughout the world. Every year, mainly in the period from spring to autumn, pipe bands around the world compete against each other at various venues, often at Highland festivals. A typical season for many competing pipe bands might include ten or more of these competitions. Europe (especially the UK and Ireland), North America, Australia, and New Zealand have active competitive pipe band communities, but there are competing bands from throughout the world. Since 1930, when the Scottish band association (today known as the Royal Scottish Pipe Band Association) was formed, there has been a World Pipe Band Championship competition, known as 'The Worlds' held annually in Glasgow during August. For competitive bands, the title of World Champion is highly coveted, and this event is seen as the culmination of a year's worth of preparation, rehearsal and practice. The entirety of the World Championships takes place on one day in August, on Glasgow Green. Typically, several hundred bands attend, traveling from all over the world. Bands arrive early and, in most grades, are required to perform in a qualifying round which takes place in the morning. The top bands at the end of the qualifying round play in a second event in the afternoon to determine an aggregate winner. To win, Grade One bands must perform in two events, a March, Strathspey & Reel event (known as a "set" or "MSR") which consists of three pre-arranged tunes, and a Medley event, which consists of a short selection of music chosen and arranged by the band. The rules for the medley contest are very open, requiring only a minimum and maximum time frame (between 5:30 and 7 minutes) and a minimum of different time signatures that must be played as well as two 3 pace rolls played at the beginning of the tune (also known as an attack). In addition to performing at 'The Worlds', most internationally competitive bands participate in a season of events that are generally held during Scotland's summer months. While events of this type are usually held at Highland Games, band competitions in Scotland, Ireland and Northern Ireland are often large enough to be held as events unto themselves. The grading and organization of these events is generally consistent with the World Championships and the events are typically administered by the governing Pipe Band Association. In the United States, Canada, and Germany, there is a fifth grade, commonly only used for beginning youth musicians. In the Novice Juvenile and Juvenile categories, band members must be under the age of eighteen, with the exception of one "adult" player, often an instructor, who may serve as the Pipe Major or Pipe Sergeant. The remaining categories have no age restriction, but are based on proficiency. Grade One is the highest of these categories, and Novice is the lowest. Grading and eligibility are overseen by the National Council and Music Board of the RSPBA, and bands can be downgraded or upgraded at the annual regrading, which takes place at the end of the competition season. A band can apply for downgrading, but will have to compete in two further contests in their existing grade. Because of time constraints, the RSPBA uses "A" and "B" designations in Grade 3, 4, and Novice Juvenile for major competitions. By doing this, bands are grouped based on prior-years' performances, and can receive promotions within their respective grade. These vary slightly throughout the world. For example, in the Republic of Ireland Grade 4 "B" is known as Grade 5, in North America, many regional associations have implemented Grade Five, an entry-level Grade, intended to help bands familiarize themselves with competition and in Australia and New Zealand there is no Novice grade at all. The future for pipe bands is unclear. Currently, there are many pipe bands that perform in parades and other public events as a primary activity. These bands are sometimes referred to as "street bands". Some military bands fall into this category as well, playing for regimental functions in lieu of, or supplemented by, competitions and/or concerts. In the competitive pipe band community, some bands are starting to find the competitive system musically stifling, although it does demand high standards. Some advocate making the transition to a Breton model, where competitions are more flexible and with fewer restrictions. Instead of giving up on the competitive model, a number of bands have instead turned to the concert stage to supplement their competitive activities. Performing in this setting allows a greater degree of musical flexibility and creativity, and encourages the inclusion of additional instruments and performers, to expand the musical possibilities. Bagad Penhars from Quimper, with bagpipes, bombardes, and drums. A lesser-known type of pipe band that has already expanded the pipe band genre is the bagad, a Breton cultural phenomenon. Bagads began in the thirties to counter the widespread decay of the living Breton folk tradition. A modern-day bagad consists of a biniou braz (bagpipe), a bombarde section, a drum corps, perhaps more accurately described nowadays as a 'large and varied percussion section' (one band's percussionists lug around a huge metal model elephant), and any additional musical instruments the band wishes to add. Common additions are clarinets, brass instruments (often trumpets or saxophones), guitars, and other forms of binious. ^ "Notes on the Musicians and music of The Black Watch, 3rd Battalion, The Royal Regiment of Scotland". Wikimedia Commons has media related to Pipe bands.